Here’s my approach at making chicken-style seitan, beer-battered, inspired/based on the seitan sausage recipes in Vegan Brunch. I love beer, but getting drunk can sometimes lead to less than stellar situations. Believe me, a nice buzz is rather pleasant, but getting snoozy, surly, or immensely lazy because you’ve consumed too much can be a downer. Not to mention, higher alcohol beer has considerably more calories – problematic for any of us seeking to shed a few pounds. Having grown somewhat tired of brewing 6-8% IPA after IPA after IPA, I’ve decided to spend more time focusing on brewing Session Beers. The Session Beer Project defines a session beer as 4.5% ABV or lower, but yet still flavorful and balanced. I can’t tell you how many times I’ve walked into a local bar and 75% of the taps are 7+ % by volume! I’m deeming my most recently tapped beer as a “Belgian Mild.” I was aiming for something along the lines of an English Mild, but with a Belgian twist – a beer that has a similar flavor profile to an Abbey Dubbel, at half the alcohol. Note: I brew far more than I can personally consume. I welcome anyone in the area who wants a try this or any of my other homebrew to ping me and you can gladly have some. Overall, I think this is my favorite homebrew to date! If you are into the idea of session beers, check out Lew Bryson’s Session Beer Project blog, or High and Mighty, a vegan-owned brewery on the East Coast. Note: I originally meant to post this many, many months ago. One of the opening events to start Philly Beer Week was a New Glarus Wisconsin Belgian Red kickoff toast at The South Philadelphia Taproom. SPTR has been a favorite beer bar of mine for several years now – I consider it the spot that truly introduced me to local craft beer in a relaxed, comfy atmosphere. When my brother still lived in South Philly too, I’d find myself there all the time. I always feel welcome, and these days, I always enjoy their vegan hoagie – a delicious mound of tempeh, marinated mushrooms, and slightly spicy homemade veganaise atop a lightly toasted hoagie roll, accompanied by fries and homemade ketchup. How good is this stuff? I usually like neither veganaise nor ketchup, but I love the versions served here. Anyway, New Glarus is a [vegan] brewery in Wisconsin, who only distribute in Wisconsin. Therefore – it is very very rare to find them on the east coast. Since they legally could not be sold here – SPTR was giving away free tastings! The Wisconsin Belgian Red is the #1 rated fruit beer on beeradvocate.com. It is delicious. Very tart, slightly sour (but not lambic or belgian sour territory sourness), midly cidery acetic, noticeably syrupy. I liked it a lot, as did Beth. When I suggested I could attempt to brew something similar, she was pretty excited. After some research I found out that New Glarus uses roughly 2 whole pounds of fresh cherries per 750mL bottle. Whoah. For me to pull that off would be nearly impossible. Not to mention – incredibly messy. I stumbled upon an old issue of Zymurgy that suggested a cheaper, easier way to clone it would involve using a lot of high quality cherry juice – roughly 20% of the volume. Here’s my attempt. Single Infusion mash at 154. Target 4 gallons of wort for primary fermentation. When primary has slowed, rack on to the cherry juice (giving you 5 gallons total) and let condition for a few weeks. The cherry juice is going to almost fully ferment in 2 weeks or so. I did this in the keg and just force carbonated when it was done. This beer turned out okay. I don’t think juice is a suitable replacement for all of the fresh cherries that the Wisconsin Belgian Red uses. The beer finished very very dry and the aroma was very one-dimensional. Using fruit puree – like the sterilized cans of puree that Oregon Fruits produces, I think, would be a step in the right direction. I recently had 3 beers place in the local Philly homebrew competition, HOPS BOPS. My hoppy tripel – an American-hopped Belgian Tripel (inspired by Captain Lawrence Xtra Gold and Stone Vertical Epic 080808) managed 3rd place in the Belgian/French category (submitted as a Belgian Specialty Ale.) 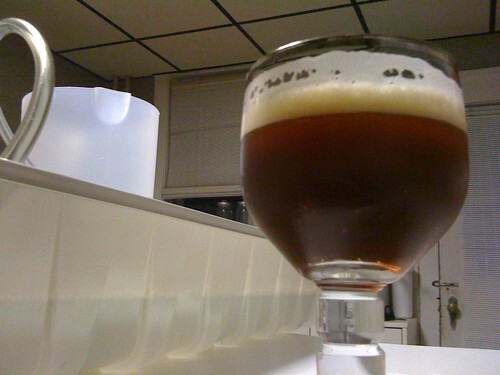 The Barleywine that Brett & I brewed last fall in Albany (and painstakingly cared for by Brett) – based on a recipe for Great Divide Old Ruffian, finished 3rd in the Strong Ales category. And the Russian Imperial Stout (based on Stone’s IRS, our favorite beer) that Brett and I brewed last December – a beer that faired miserably in the last comp I entered it in (massive points off for lactic/acidity, which neither myself nor any other people I have given bottles to have detected) finished 2nd in the Stout category. So, yay for us. It’s always nice to get some validation from people who are trained to judge beer. This is my 2nd year with success in the HOPS BOPS comp – last year my Hop Hammer (based on Russian River’s Pliny the Elder, from Brewing Classic Styles) took 3rd in IPAs, and Saisjon, a heavily spiced saison-esque beer took 2nd in Belgian/French. Infusion Mash at 150. 90 minute boil. Original Gravity: 1.081, Final Gravity: 1.009, 9.7% ABV. Dry Hopped in keg for 10 days before transferring to a fresh keg. I like to use nylon paint strainer mesh bags for dry hopping in, weighted with some heavy stainless steel nuts. I try to do as much conditioning as possible in kegs, because it is so easy to do CO2-driven transfers after the fact, limiting exposure to oxygen. Be sure to make a big starter to make sure this attenuates fully… if it does not dry out enough, it is going to be rather unpalatable. I highly recommend the Mr Malty Pitching Rate Calculator! For this beer, I used the yeast cake from a much lower gravity beer I had brewed – a [semi-failed] attempt at a Wisconsin Belgian Red clone. Over the past year or so, brewing-related podcasts have really helped to increase my knowledge and understanding – of techniques, styles, and the actual processes that are going on from start to finish. I’m a big fan of Basic Brewing, and the Jamil Show on The Brewing Network. A few months back I noticed that Jamil Zainasheff teamed up with John Palmer for Brew Strong, a show geared towards extensively covering a single brewing topic for each episode. One of the recent episodes, and by recent I mean almost 3 months ago, focused on Dry Hopping. JZ & JP brought in Mike McDole, he of the Longshot-winning-Pliny-Clone that I will be hopefully drinking soon. Anyway, since dryhopping seems to be an important but often overlooked technique, I figured I’d take some notes while re-listening recently. When to add? Approximately 90% of the way through primary. Since the process of introducing hops into your fermentor while inevitably introduce oxygen into the system, you want some fermentation activity still going on so that if can scrub that oxygen out. JZ mentions that he mostly is not concerned with introduction-of-oxygen-via-hop-addition, since racking is likely going to be a more oxygen-inducing process anyway. I recently started doing co2-driven transfers from better bottle to better bottle, better bottle to corny keg, and corny keg to corny keg, so hopefully severe oxidization will not be a problem for me in the future. Quantity? For an APA, McDole uses 2 oz per 5 gallon batch. This seems to be the standard amount for most American styles. English and Belgian styles should use a little less. How long? Usually, no more than 1 week. For Double IPAs (which would require more dryhopping… McDole recommends splitting the total in half, and dry-hopping each total 5 days apart. For light styles (not sure if this refers to light in color, light in body, etc) – it should definitely never be longer than 1 week. McDole blows co2 in every couple days to rouse the yeast and hops, which should give better utilization. Unfortunately most of us don’t have conical fermentors where this is easy to do. However, I imagine I could rig up some sort of racking-cane-and-carboy-cap based solution for my better bottles where I could blow co2 in. Taste samples! The key is to just be consistent with your quantities and times. That, combined with sampling often, means finding the perfect balance in the future should theoretically just be a recipe adjustment. Put your nuts in your sack. If you are going to use sacks to neatly contain your hops for dryhopping, you need to balance the weight of the hops with an equal amount of something else, or it will end up floating on the surface. Marbles or stainless steel nuts are good for this purpose. A tight sack is not good, it has to swing free. Hang it in and pull it out, like you are teabagging. Wow. In “traditional” German brews, dryhopping is not appropriate. This is because Noble hops tend to somehow give more flavor and aroma from boil. JZ lures dogs towards his crotch with malt extract not peanut butter. Interesting tidbit. Shadow certainly would love some malt extract. High alpha hops have more oil per weight, which produces more pure aroma, which means you can get more with less. The percentage of alpha acid and the percentage of oils are not same but often related. Hops that generally have more time on the bide, have more oil in them. Too much dryhop for too long leads to grassy flavors, due to the abundance of vegetal matter floating in your beer. Simcoe is yummy but some people think it reminds them of cat pee. JZ loves that variety of cat pee regardless. Extraction seems to be better at higher temperatures. If filtering (McDole filters his beer), and you feel as though the filtering stripped any hop flavor out – you can fix this with a recipe adjustment next time. And finally…Pliny the Elder is able to be so full and have wonderful mouthfeel despite being so dry, because the boatload of hop resins are able to provide balance and almost take the place of malts. One of my good friends was semi-recently diagnosed with Celiac Disease, a rather craptacular condition that essentially makes consuming gluten a big no-no. Most of the world’s beer is brewed with barley and/or wheat, which both contribute gluten proteins. Bummer. 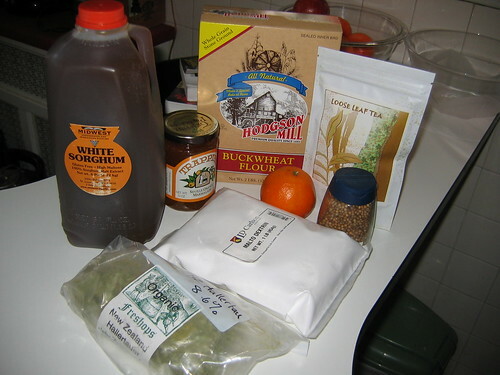 Said friend loves beer, so I figured I needed to take a stab at brewing a completely gluten-free beer, using Briess White Sorghum Syrup a gluten-free, 100% concentrated wort made from the unmalted grain of the white sorghum plant. Original guidance on this recipe came from Russ Chibes’ White Riot sorghum based wit. First off, I had a little bit of trouble finding sorghum extract. Most online homebrew suppliers seemingly used to carry it. I even recently have heard commercials from Fermentap on The Brewing Network podcasts advertising that they carry it… but that seems to no longer be the case. Northern Brewer stopped carrying it; Beer, Beer, & More Beer seems to be completely out as well. Locally, Keystone Homebrew had a small amount left, but their two locations are quite a haul for me from South Philly these days, now that I no longer work in the suburbs. Midwest still had some though. Score! One of Russ’ comments to me on beeradvocate.com when I asked him about the beer was that it needed some more orange peel character. Recently during a fun-filled week in Philadelphia Jury Duty, I spent a lot of time reading Radical Brewing by Randy Mosher. I am typically a “stick-to-the-bjcp-guidelines-and-use-proven-recipes (coughcough Brewing Classic Styles coughcough) but this book is pretty inspiring in a challenging, refreshing way. It includes lots of pointers on using non-traditional ingredients, and how to go about getting the most flavor out of spices and other additions for homebrewers. One of the sections that caught my eye was on orange peel – a typical addition to most of the world’s witbier recipes. Mosher points out that in his brewing, he has found the dried Curacao orange peel that most homebrew shops sell imparts “too much pithy bitterness and not enough orange aroma.” One of his substitutions? Seville Orange Marmalade. Usually marmalade would be a no-no in beer, since the pectin would lead to a haze, but luckily, that is quite acceptable in this style of beer! The other day at Wegman’s I stumbled upon a Seville Orange Marmalade, actually made by Trappist Monks in Massachusetts, which I clearly had to have. After chilling this down to the low 60s, I pitched a packet of Fermentis Safbrew T-58 dry yeast. Normally for a belgian specialty ale, I’d use a nice starter of some White Labs or Wyeast yeast.. But they are usually grown on barley, whereas most dry yeast are grown up on gluten-free sources of food like beet sugar and the like. I started with 5.5 gallons. 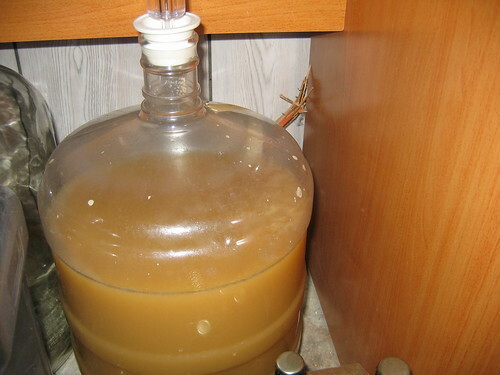 I racked from my kettle to a 6 gallon better bottle and had about 4.75 gallons. My starting gravity was 1.050; assuming I get solid attenuation like I always seem to from Fermentis dry yeast, I am looking at a final gravity in the low teens and an ABV in the upper 4s. We’ll see. Beth commented that the aromas permeating from this wort were the most pleasant of any batch to date. I think using good quality coriander, vibrant chamomile, and fresh orange zest is really the way to go with this style. I had good activity by the next morning – though there was no krausen. I’ll let it go for about 10 days or so and bottle, and hopefully we’ll be tasting in a couple of weeks.